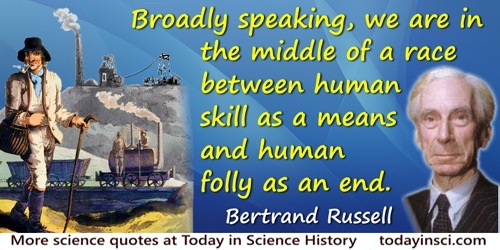 Broadly speaking, we are in the middle of a race between human skill as a means and human folly as an end. 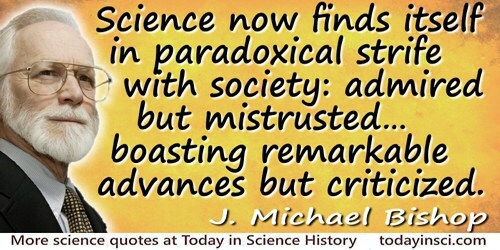 In The Impact of Science on Society (1951), 97. Science is in low regard. Some day science may have the existence of man in its power, and the human race may commit suicide by blowing up the world. Letter to his brother Charles Francis Adams, Jr. (11 Apr 1862). In The Letters of Henry Adams: Vol 1: 1858-1868 (1982), 290. The main object of all science is the freedom and happiness of man. Letter (26 Jan 1810) to General Kosciusko. Collected in Thomas Jefferson Randolph (ed. ), Memoirs, Correspondence and Private Papers (1829), Vol. 4, 145. Grow tired of scientific conversation.